This page is about the aircraft F-84B-26. For other uses, see F-84 (Family). The F-84B-26 Thunderjet is a Rank V American jet fighter with a battle rating of 6.7 (AB), 7.3 (RB), and 8.0 (SB). It was introduced in Update 1.39. The F-84B-26 is known for its versatile payload and decent top speed, but lackluster in terms of acceleration. The Thunderjet does well at destroying ground targets, given the quantity and quality of payload. The F-84B-26 can be outfitted with the following ordinance"
Boom and Run: Due to the F-84's good top speed, a good way to fight an enemy is to get up to a higher altitude and dive towards the enemy aircraft, then shoot and extend to stay out of weapons range. Once you extend, re-position yourself and repeat. Slice and Dice: Stick low and gain speed (preferably above 800 km/h), once the bowl forms (bowl is when a cluster of enemy planes form into one area) cut through the bowl selecting one target plane and take a shot followed by extending and repositioning. Enemy worth noting- every single plane which is faster than you. A slow F-84 is a dead 84, stay fast. As fighter-bomber it can be used as a normal jet fighter too, utilizing the top speed, but hindered by acceleration and climb rate. Due to terrible acceleration, the main tactic to attack enemy fighters, as well as bombers, is to use Boom and Run and Boom and Zoom. 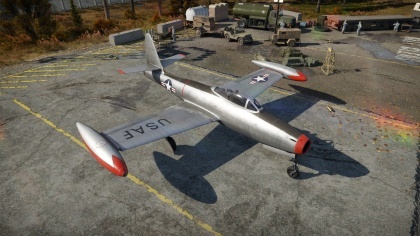 Given the inherent issues, keeping energy while flying F-84 is crucial and hard. 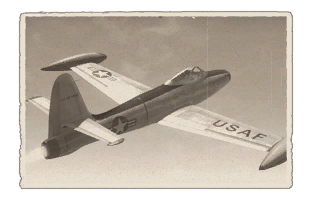 Indeed a difficult fighter to master, albeit a strict teacher for advanced jet tactics as necessary in the F-86A. M3s Brownings are very good at shooting down all types of enemy fighters, bombers and attackers. Due to very high RoF and low ammo count, trigger discipline is advised. Best ammo belts are Stealth and Omni-Purpose. Due to better belts, it's recommended to first of all research Offensive 12mm. After it, the pilot needs to focus on Compressor and Engine upgrade, due to the very bad acceleration of this jet. Afterwards, New boosters and Wings repair is the best choice. Airframe and Cover will help plane in all respects. Then all the bombs and rockets to make the plane better at ground strike. However, if used as an assisting vehicle in combined battles going straight for all payload updates isn't a bad decision either. Under this consideration take New boosters and Engine as only sidesteps until all armament modules are researched. G-Suit isn't useful because turning in this plane bleeds speed for enemies to take advantage of. At last, Fuselage repair is additional.